3.2: Click on the Check for updates button in the Update & Security window. 3.3: Install all available updates. 3.4: After the updates are installed, restart your computer. 3.5: Windows 10: After the restart, click on the Windows button and select Settings -> System -> About. The Version number should be 1607 or newer. 3.6: Windows 7 and 8.1: After the restart, repeat the steps above until no more updates are available. Please note that you usually have to restart the PC several times and check for updates every time before new updates appear. 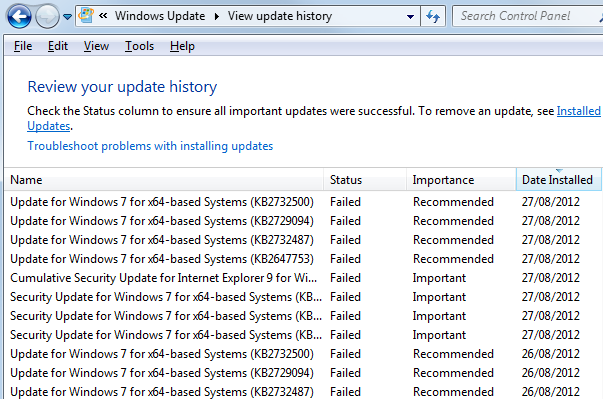 It's particularly difficult to get Windows 7 to install all updates! If just 1 update fails to install, it may prevent more updates from being installed and Windows will not warn you about it. Then search for "Failed" entries in the Status column, and make sure to install those updates too. If you are having problems after completing step 1, 2 and 3 above, please click here to attach a Windows diagnostics report to your next Lumion Support Center post, so that we can take a look at your system configuration.